The most important part of tonight’s game was what the Rangers did before and during it to honor cancer survivors. They went out and won a hard fought game on Hockey Fights Cancer night. The Blueshirts ended their skid at two by defeating the Senators 4-2 at MSG. In improving to 13-10-2, they had to like a few things that came out of the win. Lias Andersson scored his first goal of the season. A well deserved one on a hardworking shift. Marc Staal scored his first too. Always nice to see. He earned the Broadway Hat with another solid effort. Mika Zibanejad ended his goal drought at seven. It had been a while since the team’s leading scorer got one. After having some bad luck with the goalposts, he had an easier time stealing a puck and putting it into an empty net for his first goal since 11/10 at Columbus. He had a goal and assist in the victory. Henrik Lundqvist had a superb night making 29 saves including some clutch ones in crunch time to pickup his ninth win. It was a better ending than the crazy first that saw a shot hit his mask and then wait helplessly until a official noticed his mask was off with an Ottawa shot thankfully deflected before going into a net as play was whistled dead. 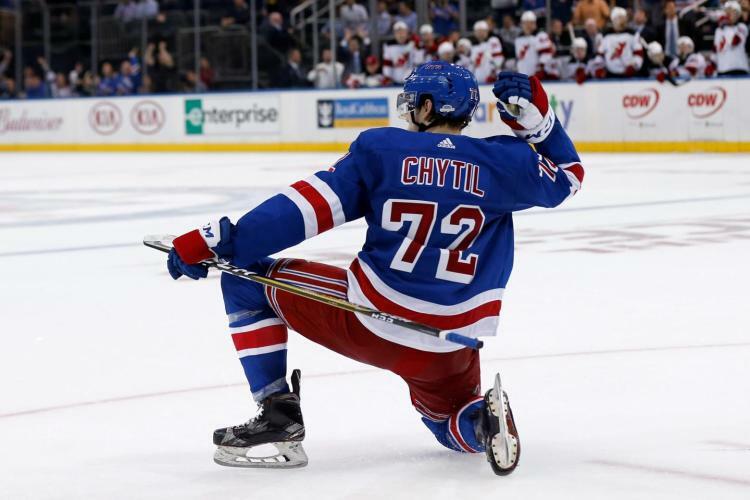 Chris Kreider got his team-leading 13th that proved to be the game-winner on a nice cross ice feed from emerging rookie Filip Chytil. Kreider is tied with Zibanejad for the team lead in points with 21. He continues to lead by example on and off the ice, looking very much like the future captain. Tim Gettinger had a second straight active game playing on the fourth line with Andersson and Steven Fogarty. His size is a good fit on that line. He added five more hits in eight shifts (7:30), giving him 10 in his first two games. Brady Skjei had a strong game overall. In 25 shifts (19:00), he skated well recording three shots, two hits, a takeaway and blocked shot while finishing plus-one. Jesper Fast had an assist, giving him points in two consecutive games. Although he remains stuck on that one goal way back on Opening Night, he continues to work hard. It’s nice to see him get rewarded. How about that move by Ryan Strome skating to the middle for a dangerous shot that banked off Andersson in front for the go-ahead goal that made it 3-2? That takes skill. Strome has it and looks like a steal for Ryan Spooner. A good trade by Jeff Gorton. Vladislav Namestnikov showed toughness throughout absorbing a couple of tough hits, including one from Ottawa defenseman Thomas Chabot late that led to Zibanejad’s goal. David Quinn said he was talking afterwards. Vladdy doesn’t get enough credit for what he brings. You have fools like Boomer Esiason talking trash during games about players he doesn’t like, which is unprofessional for a former star athlete turned morning radio host on WFAN. This is the same clown who took a shot at Pavel Buchnevich for his off-season and Tony DeAngelo last season. Stick to football! I have never been a fan of Boomer ever since he gave us the cold shoulder entering the old side entrance of MSG for his old show. He’s a fraud. I wish more people had the guts to call him on it. Just because you have a show in the city doesn’t give you the right to be so ignorant. He’s supposed to be a Ranger fan. Root for the team and support everyone. I would add more on the game, but I’m not feeling well. I’ll just say it was entertaining. Mark Stone is very good, but gets no recognition. He scored both Ottawa goals. Brady Tkachuk had two assists and was a pest. Still think Ottawa made a mistake there? He will be a dominant power forward in no time. In 13 games, Tkachuk is 7-6-13 with 17 penalty minutes and 37 shots and a 18.9 shooting percentage. I would’ve packaged all three of our first round picks to take Tkachuk at number four. One last note. The Blueshirts got David Quinn’s message, attempting 62 shots with Ottawa blocking 21. That’s more like it! This entry was posted in NYRangers and tagged Boomer Esiason, Brady Skjei, Brady Tkachuk, Chris Kreider, Filip Chytil, Henrik Lundqvist, Jesper Fast, Lias Andersson, Marc Staal, Mark Stone, Mika Zibanejad, Pavel Buchnevich, Rangers, Ryan Strome, Senators, Thomas Chabot, Tim Gettinger, Tony DeAngelo, Vladislav Namestnikov. Bookmark the permalink.